The 1995 Australian Grand Prix (formally the LX EDS Australian Grand Prix) was a Formula One motor race held on 12 November 1995 at the Adelaide Street Circuit, Adelaide. The race, contested over 81 laps, was the seventeenth and final race of the 1995 Formula One season, and the eleventh and last Australian Grand Prix to be held at Adelaide before the event moved to Melbourne the following year. In a race of attrition, all the front-running cars retired except for the pole-sitting Williams-Renault of Damon Hill. Hill won by two clear laps from the Ligier-Mugen-Honda of Olivier Panis, with Gianni Morbidelli achieving his best-ever F1 result with third in a Footwork-Hart. Of the 23 drivers who started, only eight finished, the lowest number in the 1995 season. The race had an attendance of 210,000 – an F1 record until 2000, when 250,000 people attended that year's United States Grand Prix at Indianapolis. Heading into the final round of the 1995 Formula One season, both the Drivers' Championship and Constructors' Championship were already settled, with Michael Schumacher having claimed the Drivers' Championship two rounds earlier in the Pacific round. It was Schumacher's last race with the Benetton team, having already announced that he was going to Ferrari for the 1996 season. Benetton claimed the Constructors' Championship at the penultimate round of the championship – the Japanese Grand Prix, with Williams too many points behind to be able to catch them. 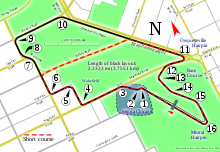 It was announced beforehand that it would be the last Formula One event to be held at the Adelaide Street Circuit, with the Australian Grand Prix moving to Melbourne Grand Prix Circuit in Melbourne from the 1996 season. In the Friday afternoon qualifying session, Mika Häkkinen in his McLaren car suffered a puncture in his left rear tyre heading towards Brewery Bend. This caused him to lose control, becoming airborne and crash heavily into a tyre barrier at 120mph. The impact caused his helmet to strike the steering wheel, fracturing his skull. Within seconds he was attended by two local doctors who were stationed at the corner, who found Hakkinen unresponsive and with a blocked airway. Häkkinen later said that he was aware of what had happened immediately after the impact, but subsequently lost consciousness. Unable to establish an airway, the doctors performed an emergency tracheotomy before taking him to the nearby Royal Adelaide Hospital. Häkkinen would recover in time to race the following season. The Williams' cars dominated qualifying, with Damon Hill in pole position and David Coulthard alongside him. Schumacher was third in his Benetton, with the Ferrari drivers fourth and fifth, Gerhard Berger ahead of Jean Alesi. Heinz-Harald Frentzen rounded out the top six in his Sauber. The race took place in the afternoon from 14:00 ACDT (UTC+10:30). Despite starting in pole position, Hill lost the lead at the start, with Coulthard taking the lead at the beginning. Schumacher also lost ground at the start, with Berger moving into third and Alesi moving into fourth. Schumacher made his way back up to third, overtaking Alesi on lap one, before overtaking Berger a few laps later. Coulthard kept the lead until the first round of pitstops. However, he came into the pitlane too fast, locking his front tyres and ran into the pitwall. He was forced to retire from the race. A few laps later, Forti's Roberto Moreno spun and caused terminal damage to his suspension in the same place where Coulthard had crashed earlier. After the first round of pitstops, Schumacher and Alesi collided, with both retiring. Schumacher's Benetton team-mate, Johnny Herbert took second place briefly before coming in for his first stop later than many of the other drivers, while surviving a potential accident which was very similar to Coulthard's, missing, however, the pit entry and rejoining the track. Berger was promoted to second, but his Ferrari encountered an engine problem, forcing him to retire. This promoted Frentzen to second, but he too retired due to a gearbox problem. With many of the front-runners out, Hill led at the front, with Herbert second. Jordan driver Eddie Irvine rounded out the top three, before retiring after losing all of his pneumatic pressure. Herbert was still second, and looked set as a result to claim third place in the Drivers' Championship. He was, however, forced out of the race as his Benetton suffered a driveshaft failure. Olivier Panis was now second in his Ligier a lap behind Hill, with Footwork driver Gianni Morbidelli third, two laps down. However, with a few laps remaining, Panis' Ligier was suffering an oil leak. Hill lapped him for a second time on his way to victory. Panis remained second, with Morbidelli third for his only career podium, and the first podium for the Footwork/Arrows team in 6 years. Behind the top three, Mark Blundell was fourth in the sole McLaren, with Mika Salo fifth in the Tyrrell. Pedro Lamy after a spectacular mid-race spin rounded out the points with sixth in his Minardi – his only Formula One point. Only eight cars finished the race, with Pedro Diniz seventh place being Forti's best Formula One finish at the last grand prix at Adelaide. The race was televised by Channel 9 in Australia and by the BBC in the UK. The race marked the end of Pacific Racing, as the team went back to International Formula 3000 for 1996. In a last gasp effort, Pacific tried to have their test driver Oliver Gavin in the seat, but he was not granted an FIA Super License and shareholder Bertrand Gachot was in the car. It was only the second time the winner won by two laps– the first time was at the 1969 Spanish Grand Prix when Jackie Stewart won. Hill, who had come in for an enormous amount of criticism for his performances in all of the three previous races, was praised by commentator Murray Walker for this performance, with Walker immediately citing that, with Schumacher and Coulthard's imminent moves to Ferrari and McLaren respectively, Hill would be a strong favourite to win the title in 1996 if he could continue to perform in the way he had done so in this particular race. This would also be the last race for a V12 engine, specifically Ferrari. The Italian outfit would use a more fuel-efficient V10 engine for 1996. Although he failed to finish, by competing in the race Gerhard Berger earned the distinction of being the only driver to have driven in all 11 Formula One Grands Prix held in Adelaide. He had driven for Arrows-BMW (1985), Benetton-BMW (1986), Ferrari (1987, 1988, 1989, 1993, 1994, 1995) and McLaren-Honda (1990, 1991, 1992), winning the race for Ferrari in 1987 (as well as claiming pole position and fastest lap) and McLaren in 1992. The post race concert was headlined by American rock band Bon Jovi, who performed at the nearby Victoria Park Racecourse. Wikimedia Commons has media related to 1995 Australian Grand Prix. ^ a b "1995 Australian GP – LX EDS Australian Grand Prix". ChicaneF1.com. Retrieved 10 March 2008. ^ a b "EDS Australian Grand Prix – 1995". The Formula One DataBase. Archived from the original on 3 July 2008. Retrieved 10 March 2008. ^ a b c d e f g h i j k l m n o p q r "Grand Prix Results: Australian GP, 1995". GrandPrix.com. Archived from the original on 20 February 2008. Retrieved 2 March 2008. ^ a b c "1995 Australian Grand Prix". formula1.com. Retrieved 15 January 2018. ^ "Schumacher – simply the best – again". Grand Prix Racing. Archived from the original on 14 November 2007. Retrieved 2 March 2008. ^ a b "1995 – Glimpses of greatness". F1Fanatic. Archived from the original on 22 February 2008. Retrieved 2 March 2008. ^ "Constructors' title goes to Benetton – care of Mr Schumacher". Grand Prix Racing. Archived from the original on 14 August 2007. Retrieved 2 March 2008. ^ Saward, Joe (12 November 1995). "Globetrotter: Thank you Adelaide". GrandPrix.com. Retrieved 25 March 2008. ^ Taylor, Simon (September 2010). "Lunch with...Mika Hakkinen". MotorSport Magazine. London: 80–86. ^ "Hill takes a consolation win". Grand Prix Racing. Archived from the original on 20 May 2003. Retrieved 25 March 2008. ^ "Australian Grand Prix: 2nd Qualifying". galeforcef1.com. 11 November 1995. Archived from the original on 20 October 2006. Retrieved 11 December 2009. ^ a b "Australia 1995 - Championship • STATS F1". www.statsf1.com. Retrieved 6 March 2019.